Product provided by PR Firm In exchange for my honest opinion. Images and story are my own! Quietly there she sat, in a little cage, just a few pounds small and looking intently into our eyes and my daughter connected with her immediately. Small, black, with a bit of white the most perfect little tuxedo cat with a beautiful pink nose was waiting for us. All the other nutty, crazy cats were running around the pens, the room, fighting, squawking, but not Bella, she was just not like that. A few pets later and a few snuggles more, suddenly we had a new family member named Bella. Bella the cat moved into our lives when we rescued her from a shelter and she has been moving in more and more as time moves on. We learned from the beginning it does not take much to amuse our cat, a simple milk ring will do the trick, but, we also have learned that after all the loving, snuggling and holding, a cat is not a dog, and she prefers to retreat for periods of time into personal space. Where Bella disappears to is often a mystery to us yet, be we all want her to be very comfortable and have a ‘place’ to call her own! Remember cats don’t care if they give you personal space, but they demand they have theirs! Here’s how to give your cat personal space and lavishly live with your cat, or cats out loud! If you have been keeping up with all things Bella you know that she has her own bedroom and she goes to bed when we go to bed. Bella the cat is such a trooper, some days I swear we treat her more like a dog than a cat, in fact, everyone totes her around. Bella is in our arms more than she is walking around and when the kids go to school after a full weekend of cat love, she is so tired, she just slinks into one of her little corners and I don’t see her again until about 3:30 PM when the kids come back home from school. Recharged, rejuvenated and ready to rough, rumble and tumble, Bella meets and greets her family, and then it all starts again, holding, kissing, hugging,loving all way too much for a cat! 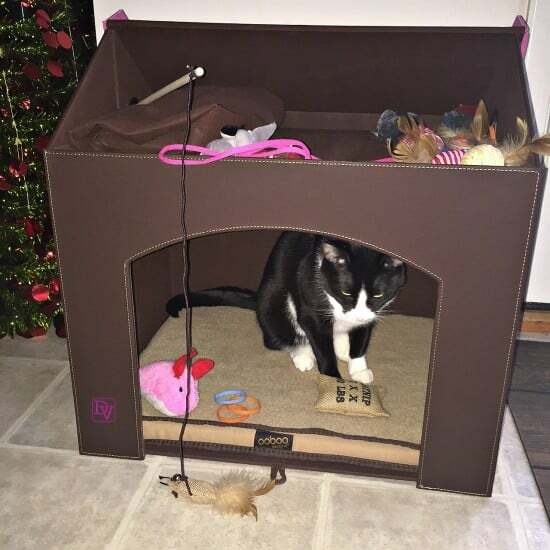 This is Casa Bella, the Pink Pet Haven 2 indoor folding pet house created by Ooboo Designs. This is totally easy to assemble and will give your cat/small dog somewhere to rest their little bones! No more hiding in those corners, or just using a chair, why should she have to? Bella deserves a deserves a specialized Casa Bella of her own. The Pet Haven 2 in brown and pink delivers on style, comfort and storage! You can see above how flat the box was when it came into my house from the mail, and you can see that it is shipped in its tote bag, so really you can flatten this house down and take it with you so that your cat/pet has some part of YOUR home with you. This as we all know is so important because with cats its all about the marking, the rubbing up against, etc. The diva Bella needs somewhere to go to, that has four walls and a roof, somewhere that sets up boundaries, because honestly if we look at her, our heart melts and we just want to pet her(poor Bella) but Bella can enter her personal space in a Pink Pet Haven 2 and just get away from it all. This is super easy to assemble, and it is able to be stored flat, or stored flat to travel and set up when you get to your vacation destination. Did Bella go right in? Actually she did I was surprised because as you all know cats can be real little stinkers about learning a new place, but she did go right on in and she thought she was something else for doing so,take a look. This is 21″ x 17 ” x 21″ . Th Pet Haven 2 pet house was created for small dogs up to 21″ long and any size cat. Bella could fit a few friends in there if she had them. When she first entered Casa Bella She went in, turned around and just looked at us like, “WOW is this comfortable and is it really for me? ” The Sleep pillow that is located on the lower floor is a washable 2 sided memory foam sleep pillow and it has a 2 sided pillow case that is created out of Sherpa fleece and cotton.It is really nice I’d like to curl up on it! As you see my son, unfolded the house and it was 2 levels, yes I did say 2 levels. The second level has a multi-use as it can either be used to store toys or for the cat to sit on. I am not certain what the weight amount might be for pets, but Bella is Under 10 pounds so I was sure the floor board would hold her. Again, I put toys up in here and of course Bella rules the roost and she went up to the second level, sat on them and tossed the toys out one-by-one, now taking ownership of the 2nd level of living as well. What my little Diva does not understand is that when she goes to her bedroom for the night, I will return all the toys to the top and put the lid on Casa Bella so that we don’t have to see all of those toys lying around the house! And of course I know the return on my clean up is simply going to be Bella The Cat taking all the toys out again, but that is just fine with me! We can move her home around from room to room easily as it offers side carry holes and there are rear ventilation holes so no worries. The clean up on this home is super easy, after all, with her little but in there and the cat box feet, we can wash the pillow case and wipe down the walls as this is a faux leather exterior, and made of sturdy fiberboard. The home requires no tools for set up and offers EVERYTHING your pet needs: privacy, warmth and comfort and then of course the ability to watch everything going on in her environment! 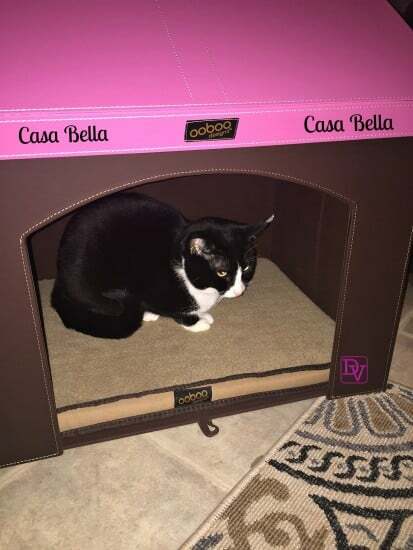 Casa Bella is an adorable, sturdy, 2 story home, that folds flat when we need it to, and makes Bella the cat very happy. The home looks stylish(unlike the cardboard box she had taken up residence in) and it offers comfort to Bella when she rests and storage to her toys. 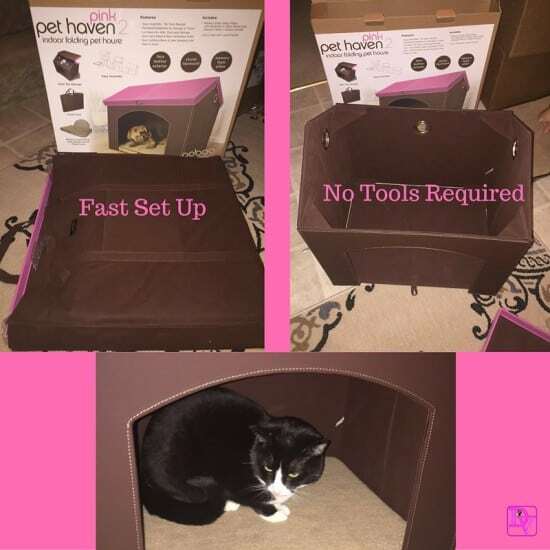 The Pet Haven 2 is a remarkable must have for all cats and small dogs, offering a sanctuary to hide in until they are ready to be cuddled and snuggled more. Now you know How To Give Your Cat Personal Space. These are the most amazing homes I have ever seen for a pet, they are lavish, comfortable and great to look at, let your pet lavishly live life out loud and in a haven all of their own! This is great. We have 3 cats, 1 outdoor mostly, 1 indoor mostly, and 1 that can’t decide lol, but especially in these colder months when they’re all in the house more, they do need their personal space or dare I say, they get catty with each other. How cute. Cats deserve a sanctuary too. Omg what a cute kitty house! I have two fur babies that would love this! Every bed/house/tree I’ve bought for my cats have gone un-used lol. They always prefer the couch, the bed or literally anywhere else in the house! Awe that is really cute. We are planning to own a cat in the near future so I can see this being a great item to have. What is it about boxes and sharp edged things that my cat likes to rub across. What a cute space this is. I don’t have a cat, but I will share this with friends who have kitties. You know what? I think our cat would really like this! She’s a low dweller, and she loves nooks and crannies like that. Liz Mays recently posted..Knock Out Holiday Stress with Everlast Boxing Gear! My kitties would love this hut. Such a great hideout. I don’t have a cat but I get it. It’s really lovely! I bet they will enjoy having one of this! 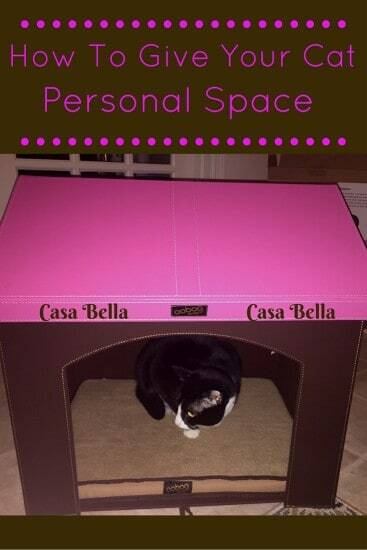 Casa Bella sounds really great for cats! It looks really cute and comfy too. I am a dog lover not a cat but I love these boxes for personal space. Love the spacious and colorful design so fashionable for any cat. Aw how adorable is Bella in her new home? !I love how spacious it is and the design is very cute too. What a nice space for the cat. It looks nice to and can hold all the cat toys. I am not a cat owner – we have a dog and he definitely has no interest in personal space LOL.